Things couldn’t really get worse for Justin Bieber at the moment – or could they? Following his recent antics in London which included him being two hours late for one of his concerts at the O2, today saw Bieber’s London saga reach another new low. While leaving his hotel Bieber became angry at one of the waiting photographers and lashed out in what can only be called a remarkable manner. He had to be restrained by one of his minders after responding to a tirade of swear words from the pap with a tirade of his own. The footage was caught by UK broadcaster Channel 5. You can watch the video of Justin Bieber lunging (it hardly constitutes an attack but be warned, the language is not pleasant!) at the photographer above. 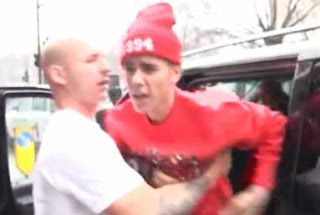 You can also hear the photographer accusing Bieber and his entourage of assauly. This is the latest incident in a catalogue a of increasingly strange behaviour by the young pop star. It has led to some people speculating that not only Bieber’s physical health but his mental health is become an increasing source of worry to his management.